Brighton Greenhouses - Featuring 4mm twin-wall polycarbonate panels, 7' 5" peak height, 6' 5" door height, and free base kit! 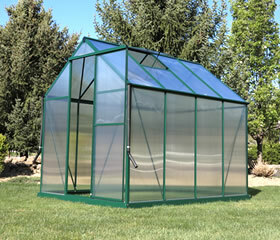 Brighton greenhouses are some of the most affordable, durable, and easy to use greenhouses on the market. Brighton greenhouses feature 4mm twin-wall opaque polycarbonate panels to balance sun exposure throughout the day. These panels offer a good balance of thickness for insulation with plenty of diffuse light transmission which protects your plants from harmful direct sunlight during mid-day. This system will provide you with the best growing environment possible, and will make your growing experience a snap! Shop Brighton greenhouses, and get started on your growing today!